Which makes me wonder, where can I get this CERES global surface temperature product? Turns out CERES doesn’t make one, but if you delve into the comments (ewww!) one hears that Willis has an algorithm to make one based on CERES data. Ew. Curiously, his graph says “Trend = 0.07°C/decade” and talks of a p-value that’s “not statistically significant.” Mine says the rate is 0.20 °C/decade, with a +/- of 0.09 °C/decade (that’s 2sigma), which is definitely statistically significant. I don’t have much confidence in the data he’s using for surface temperature. Add to that little or no confidence in his ability to determine the trend, and you get some serious skepticism of his claim. There are some blue splotches on the map, no doubt. But hey, that’s to be expected given the uncertainty level in a mere 18 years’ data. 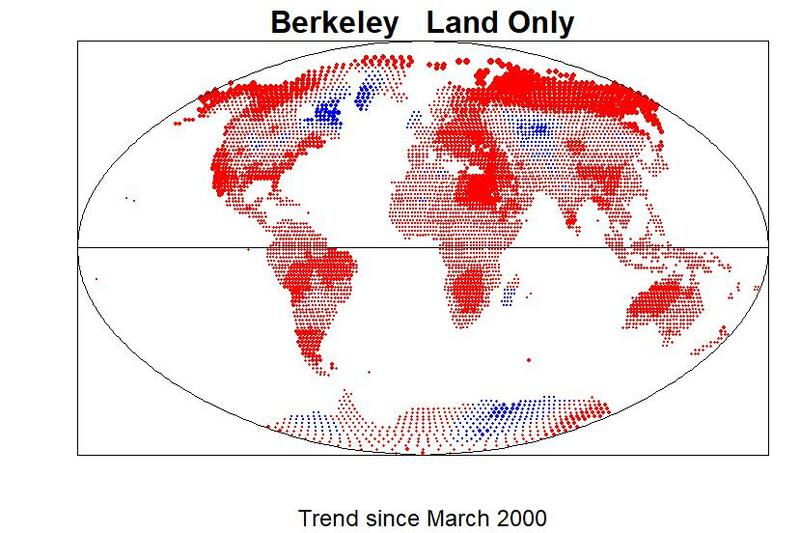 Red areas dominate, because face facts people, the land areas are heating up faster than the oceans. 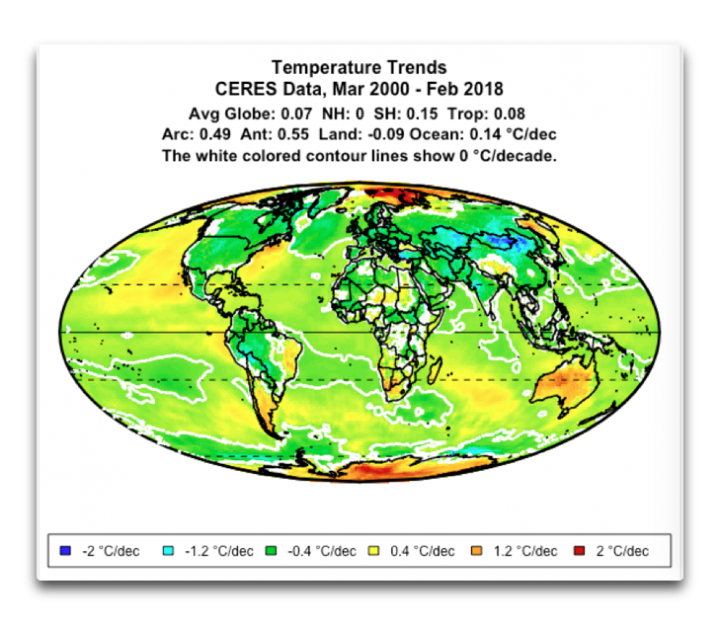 A post titled “Cooling Down the Land” claiming that the land is cooling, is rather effectively refuted by the fact that the land is heating up faster than the oceans. 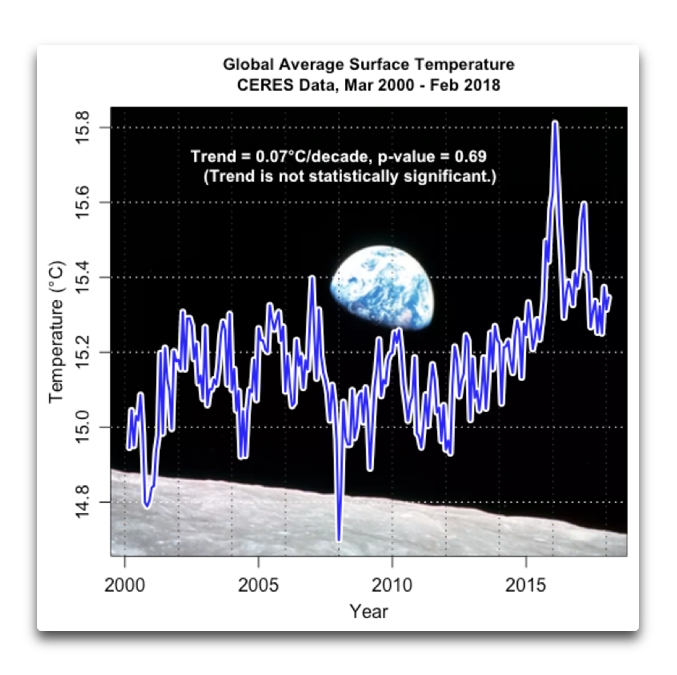 Which are heating up too, despite the claim that the global trend since March 2000 is “not statistically significant.” Actually making these claims public, may be the biggest lapse of judgement. Follow the money. Willis E will be rewarded for his PR work for certain industries. I’m agnostic on what rewards Willis will reap from his efforts, and from whom. But does it matter? His history of erroneous analysis tells a compelling tale regardless. And his error rate isn’t cooling down any more than the planet is. There are some blue splotches on the map, no doubt. But hey, that’s to be expected given the uncertainty level in a mere 18 years’ data. Even if I didn’t know about the “cold spot” off of southern Greenland, I wouldn’t be surprised that in a complex system some places might go against the general trend. After all, there are parts in the Mississippi River where water goes “upstream” (eddies), and some rocks can bounce to higher ground in an avalanche. A few years ago CERES was the bright new dataset in the world of radiation datasets. I suppose if you took clear-sky top of atmosphere outgoing longwave radiation you would have something related to surface temperature. Interesting to see how it relates to the ground truth of direct physical measurements from thermometers. Actually, thinking about this, if this is what he’s done then it’s surprising there’s a positive gradient at all. You’d expect that increasing carbon dioxide would reduce outgoing LW, which would look like a cooling tend with a simplistic use of Stefan-Boltzmann. There must be all sort of other spurious trends in the data. There is a CERES EBAF surface dataset. It uses a lot of radiative transfer modelling. But it’s set up to give heat fluxes, not temperature, and would need an algorithm to get temps instead–just a WAG, but quite possibly it would make the most sense to start from the radiance measurements, which are the first step in the EBAF. The two graphs from this year and last look to show the same data but strangely this year’s version has lost over a third of the declared warming trend which I would judge to be exceedingly careless of him. Indeed, last year his global trend given in the gridded map is different from his global trend on the time series graph, the map value thus losing almost 40% of its trend through including this additonal year’s worth of data (Mar 2017-Feb 2018). At a more detailed level things look even more dodgy. For instance, according to his mapped data graphic, Eschenbach manages to find a global land warming trend of 0.19°C/decade 2000-2017 (or perhaps it is 0.14°C/decade 2000-2017 as presented in the lower panel of the graphic) but shows it as dropping to zero with the addition of a further 12 months of data. Evidently Eschenbach has a grasp on trend calculations wildly different to us mere mortals. Yet this rather begs the question why anyone would bother with this ‘infernal’ temperature series if it yields “little difference” from HadCRUT. But of course, Eschenbach is taking the piss with his assertion about finding “little difference.”. We can easily calculuate the temperature trend from HadCRUT4 (which underestimates the global value due to coverage) and it is nothing like Eschenbach’s ‘infernal’ result. So if Eschenbach “found little difference,” he must be speaking in some Wattsupia (forked-)tongue. He certainly isn’t speaking honest English!! 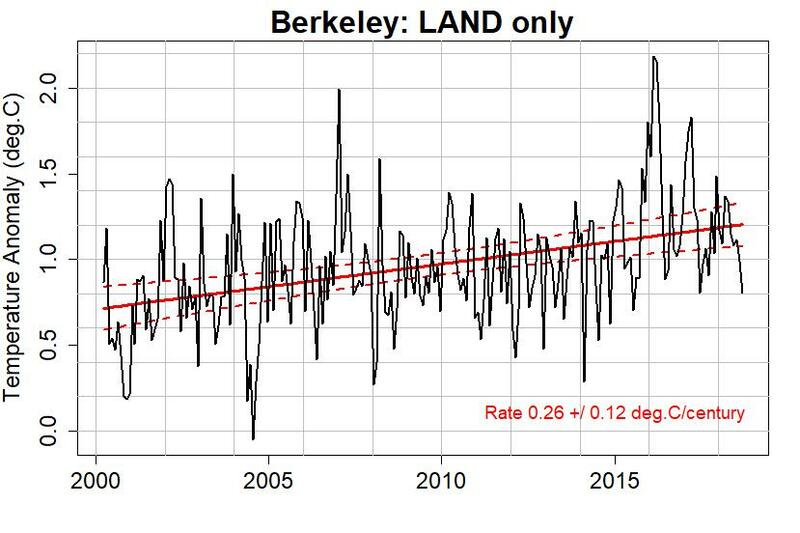 In the figure Berkeley LAND only, there is a label saying “Rate 0.26 +/ 0.12 deg/century”. I believe that should be “per decade” not “per century”. And yes, that shows that the land is warming up fast! I wonder if Willis would be ready to place a bet in favour of future cooling / plateauing / lukewarming? He’d be wise not to, given the track record of those who’ve done so to date. Hautbois, as long as Eschenbach is allowed to use his own calculation of the trend, he is certain to win. I see that Eschenbach is saying in a new post on Wattsupia that for the Wattsupian post being discussed here “I was 100% wrong.” In this he is referring to the trends he calculated. He now reckons that his corrected results are a reasonable match to Woy Spencer’s UAH TLT record and because he and Woy have similar average trend numbers over land, all the surface temperature records have to be wrong and he & Woy are right – all a bit too feeble to support his grand finding, but denialism is a funny old thing. I suppose as Eschenbach brands himself somebody who “hates to be wrong,” now he feels a bit happier with his new results, he therefore believes that he must now be entirely right … until the next one of his gross errors surfaces and requires yet another feeble excuse to support his denial. Eschenbach’s comment that his error was “I’d tested it without remembering that trends in sinusoidal datasets are heavily affected by the choice of endpoints” suggests that he was calculating trends in raw monthly temperatures rather than anomalies. Although (and I’m doing research on this with a student) using anomalies doesn’t entirely avoid the problem. I did wonder about the comment Eschenbach made about the source of his error. For a start, he did the same calculation last year with a year’s less data and made a show of the conversion into anomalies, creating this graphic. And if he did have a ‘brain-fade’ moment re-running the same calculation with the extra year’s data added, would three extra months hanging off the up-stream end of 213 sinusoidally-symetrical data points make such a difference? It’s of the right order but not enough to zero all of a +0.014/yr trend. So I don’t think I can accept his excuse. I just did a quick test with ERA-Interim Reanalysis global mean surface temperatures, Mar 2000-Feb 2018. 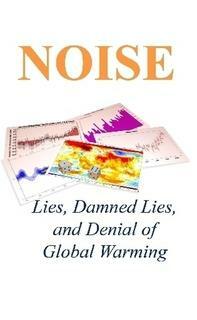 The trend with anomalies is 0.19 C/decade. 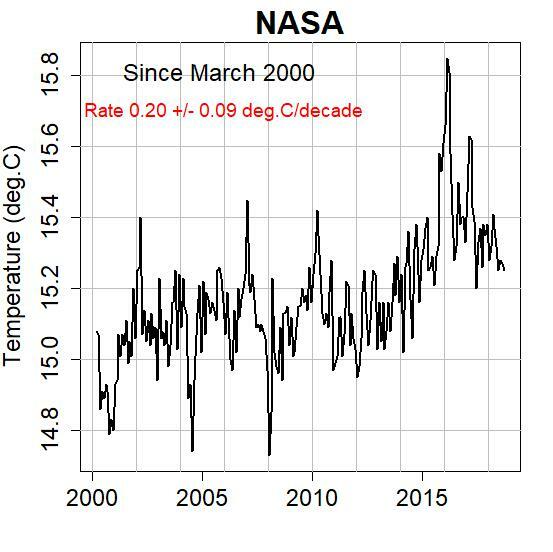 The trend without anomalies, allowing aliasing by the seasonal temperature cycle, is 0.11 C/decade. Willis reported 0.07 C/decade originally, and 0.14 C/decade with the error fixed. The size of the difference is consistent with my postulated explanation, but you’d have to check with Willis to know for sure. For everyone else, the way this works is that JJA is globally about 3 °C warmer than DJF. So if you start in March and end in February, the first few months of the time series are guaranteed to be warmer than the last few months of the time series. …and before anyone asks, no, it’s not because the Earth is closer to the Sun in JJA. (It’s not; look it up.) It’s because the NH has an oversized influence on the global temperature cycle because so much of the NH is land and undergoes massive seasonal temperature swings compared to ocean surfaces.